Cookie and I recently spent two weeks touring Italy, specifically, Venice, Florence, Rome, Siena, Bologna, and the Cinque Terre. We did not structure this as a culinary vacation, but rather a sightseeing trip where we tried to eat well. What follows is a non-chronological breakdown of what and how we ate. Let's get this out of the way immediately. Pizza follows you through the major tourist centers of Italy. It exists at every turn in a variety of styles. We ate more of it than we expected to, but not nearly as much as its availablity would lead the average tourist to eat. When we arrived in Venice on our first day, overwhelmingly exhausted from jet-lag and a 30-minute search for our hotel (which was a few hundred yards from where I stood with the map for 10 minutes saying "it should be RIGHT HERE! "), we needed some food. I didn't have the energy to look at a menu or talk to anyone. I just wanted to point and eat. So, my first meal in Italy was a slice of pizza from a tiny shop that had a couple ovens and a counter opened to a tiny alleyway. It was one of the better pizzas I tasted. A) Large, round flat pies, most common in Venice (See above). These were crisp, light, and probably very familiar to New Yorkers. We did our best to adhere to an Italian-style dining style while eating meals. We generally found ourselves splitting one or two antipasti, ordering two pastas, and sharing one segundo. The weighting here is based on the way we discovered the quality of the meals to be weighted: The pastas were the best things about dining out---by far. Tourist dining tip: Avoid restaurants where the prices of the pastas are in-step with the prices of the segundi. I found that a trattoria that has more modestly priced pastas is serving smaller portions, more in-step with three-course dining. Higher priced pastas tended to mean American-style portions (for people who are only ordering pasta) and lower quality. Yes, you read this right--lower prices means higher quality. This was nearly a perfect plate of pasta. Creamy without being heavy. Toothsome, fresh noodles. Rich, salty, fatty guacinale playing perfectly with sweet caramelized onions. I can't say enough good things about this dish. Perfectly spiced. A great example of this classic. Not pictured is a paparadelle with a lamb and juniper ragu from Il Santo Bevatore in Florence. This restaurant felt a lot like the Lula of Florence--a chef using some creativity, a lot of locally sourced ingredients, and a lot of young tattooed staff members. The ragu was well balanced and the noodles were just right. The dish was punctuated perfectly with a long slice of the bark off of the roasted lamb laying on top--a very nice touch. This one is from a restaurant called Gambero Rosso in the main piazza of Vernazza. It is an expensive place that has a perfect view of the water and the piazza. Pictured are (clockwise from the one o'clock position): fried, salted, stuffed and pan fried, and lemon-cured. This plate with some wine and bread makes a perfect lunch. This one is from a much cheaper spot in Corniglia, overlooking the town parking lot. Lemon-cured, salted, and sauteed with onion. There is a native Vernazzan dish called tegami which is simple and delicious. It's a casserole of layered sliced potato, fresh anchovies, and sliced tomato. There is no complex sauce. Some simple oil and balsamic vinegar. It is excellent. Clockwise from top-left: Swordfish in tomato sauce, lemon anchovy, salted anchovy, octopus with olive and potato, tuna with red onion, (center) salmon tartare. I had a very hard time with vegetable contorni in Italy. By the end of the trip we found ourselves ordering plates of chicory cooked in garlic, which agreed with the Italian-style of cooking vegetables long past crisp--asparagus was often ordered early in our trip and it was always awful. Sweets are everywhere. I don't know how restaurants sell dessert when each block contains at least one gelateria and one bakery. 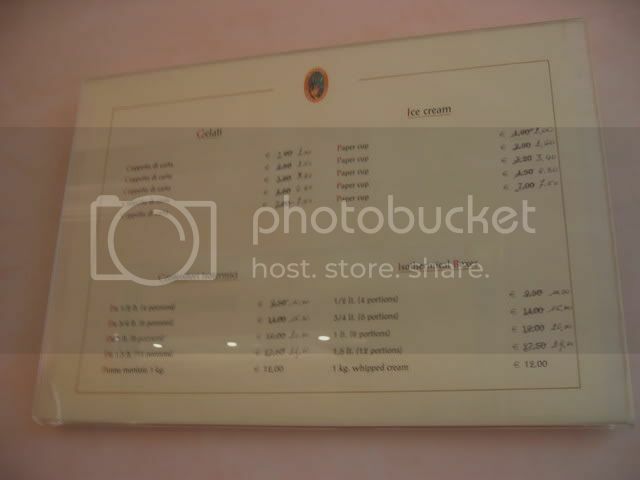 Tourist Gelato Tip: Look for the words produzione propria, which essentially means that they make the gelato themselves. There are thousands of gelaterias, which means that a lot of it comes trucked in from factories. The places that make it themselves are turning out a product that is, by far, of a much higher quality. (This does not seem to apply in Rome, where even the places that we knew made it themselves did not display this notice). 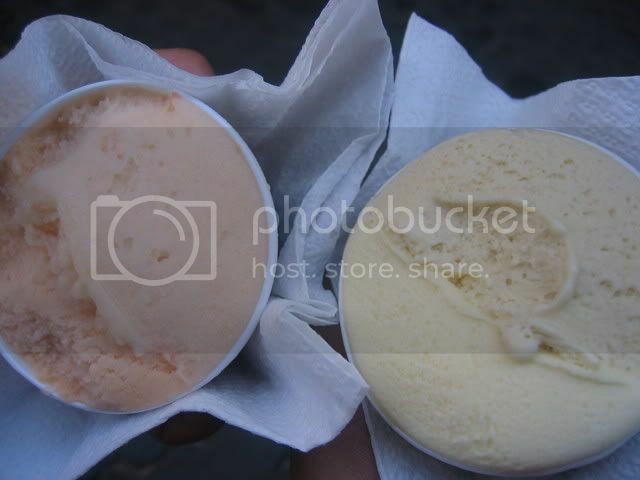 There are two very good gelaterias across the road from each other along the Via Dei Calzaiuoli in Florence between the Duomo and the Uffizi. They're the biggest on the street and they both make their own. You can't miss them. Since we moved around so much and never had a kitchen, we couldn't do much shopping. But we did explore a lot of markets and delis. If I had nothing but time, I'd love to rent an apartment in Bologna for a few months. They have the most extraordinary ratio of delis, cheese shops, and fresh pasta markets to people. Beyond the outdoor fish and vegetables markets, It seems like every block in Bologna is a cook's paradise. --Surprisingly, I found dining out and acting as a tourist to be a bit incongruous. We did not take a "food vacation" as we often do. Rather, we took an Italian vacation and tried to eat as well as possible. There are thousands of restaurants that surround the tourist centers of Italy and we found, not surprisingly, that the further we moved away from the teeming crowds, the better and more interesting the food became. 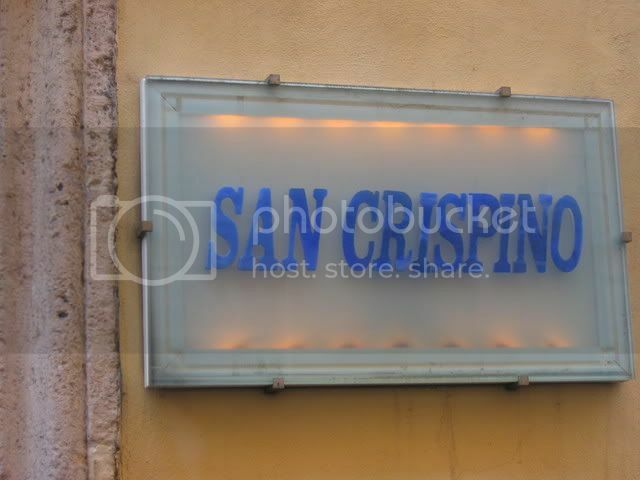 --Our food instinct taught is to avoid restaurants that advertised things that would attract non-Italians: multiple languages, "no cover charge" (since you can stay as long as you like in a restaurant a coperto is commonplace, and shiny photographs of every dish. ...chalkboard menus that have no English and show exaclty what's good today. --In Florence and Rome we learned to cross the river to the neighborhoods where regular people actually live and eat, away from the major sights. --Order the house wine. It's a gamble that pays off. It's usually local. It's always dirt cheap and most of the time it's very good and works very well with the cuisine. I drank liters of house wine, red and white, and I can think of only one occassion where it was not a good, drinkable wine. --I also learned that throwing yourself into local customs makes the whole meal more enjoyable. A campari before dinner, house wine and fizzy water with a three course meal, and a glass of grappa afterwards makes an immensely enjoyable evening. You often see tourists who are trying to force the experience to fit into their expectations of a meal. I distinctly remember the American diner who asked the waiter about the vintage and source of the house wine, which bought him an odd response. Learn the local customs, they are meaningful and enjoyable. This really scratches only the top of the pile of gelato. Two weeks in Italy means 28 meals (not including breakfast which is really not much to speak of) along with snacking, sweets, coffee, and drinks nearly every day. This post could go on for days. I hope you enjoyed it. We really enjoyed ourselves. Here's a link to the full food photo set. I'm hoping to follow this up with a few more concrete recommendations. Names, addresses, etc. What a great post!! Your mistake was not taking me along to carry your luggage. We would have found Pizzarium and every decent pizzeria along the way. Now that I've looked up the address, I see that Pizzarium is in a part of town we spent very little time in. Also, when I suggested trying to find it again, my dear wife gave me "the look" and said, "I think I've had just about enough pizza". (This was day 13 of our trip). Nevertheless, Antico Forno is a fantastic place with excellent pizza. Thanks for posting about it. I might not have found it otherwise. I've been eagerly anticipating this write-up and am even more impressed than I could have hoped. What a wonderful (and delightful) guide. We expect to print it out, study it, and take it with us in the fall when we visit Rome (assuming we can pry the address for San Crispino out of you). Sadly, we haven't any more than a week, but this will be the perfect LTH supplement to Lonely Planet. Grazie mille! thanks for the write up EC, off to Cinque Terre t'row but it looks like rain for Guvano beach. Wonderful notes... thank you for posting! When left to decide where to eat from a narrowed down set of choices and/or recommendations, My restaurant rule in Europe is very simple: Percentage full of non-tourists, minus percentage full of tourists. A place that is completely full, has no English menu, and looks like it hasn't seen a tourist in six months... that's what will get my attention. threadkiller wrote: When left to decide where to eat from a narrowed down set of choices and/or recommendations, My restaurant rule in Europe is very simple: Percentage full of non-tourists, minus percentage full of tourists. A place that is completely full, has no English menu, and looks like it hasn't seen a tourist in six months... that's what will get my attention. This is a notion that people have told me before but I believe that the idea is much more complex than that. Many of our best meals were in places where there was a good concentration of tourists and we had some rather uninspiring meals in restaurants that were 100% full of people from the neighborhood. The fact of the matter is that in the cities that we visited, tourism is the top industry (and if it's not the top it's in the top two). Practically everyone is depending on the tourist dollars. Also, there are a lot of Italian tourists touring their own country, so there are plenty of places that are catering to them. The key is to find the places that are comfortable with the fact that they are doing business with tourists, but staying true to their local culinary ideals and not kowtowing to tourists. This is why multi-lingual menus are a put-off. Bi-lingual menus are almost so common that it does not signify a bad place, but when you see Italian-English-German-Japanese on one sign, you've got a safe bet that you should move on. You've got to read a lot of menus and talk to a lot of people. You'll start to see patterns in menus after a short while, and the menus will start to change as you depart the tourist centers. Many restaurant and shop owners are happy to meet tourists who are interested in their local food and never compromise their quality. I guess what I'm trying to say is that in cities full of tourists, if you consider the presence of tourists in a restaurant to be a bad thing, you'll go hungry very quickly. It's also worth noting that many of tourist-mobbed restaurants become so precisely because they're so good. Picking restaurants in a foreign land is very intimidating to many, so when word gets out that, hey, this place is pretty damn good, you get a herding effect. The question is, as Michael points out, does the restaurant respond by staying true to itself, or making unnecessary adjustments? One of my old favorite haunts in Florence, Trattoria dei Tredici Gobbi, is the perfect example. My first visit was when it had recently opened, I believe about eight years ago. At that time, it was a new but cozy family joint that you could almost always walk into off the street and have a spectacular meal. In the following five years, I visited Florence three or four times, and by my last visit in 2004, it had become a very tough reservation to score. Though locals were present, the tourists had obviously discovered the place and were there in abundance. But at the time, the food was still dynamite. Unfortunately, Michael had a very unsatisfying meal there (sorry again, Michael), as it appears they've now created something of a "tourist room" and the quality of the food has dropped considerably. But I can attest that they certainly didn't start out that way. Dmnkly wrote: It's also worth noting that many of tourist-mobbed restaurants become so precisely because they're so good. Picking restaurants in a foreign land is very intimidating to many, so when word gets out that, hey, this place is pretty damn good, you get a herding effect. The question is, as Michael points out, does the restaurant respond by staying true to itself, or making unnecessary adjustments? This is a very solid synthesis of how I see it. *Crostini all fiorentina is essentially a sauteed chicken liver paste on toast, and it is simply wonderful. If you find yourself in Florence, order some, no matter where you are. Beautiful, thougtful and informative post, Michael. Thanks! Gypsy Boy wrote: I've been eagerly anticipating this write-up and am even more impressed than I could have hoped. What a wonderful (and delightful) guide. We expect to print it out, study it, and take it with us in the fall when we visit Rome (assuming we can pry the address for San Crispino out of you). On the other end of the atmosphere spectrum from San Crispino, I'd also recommend the famous Giolitti. Excellent gelati at a very reasonable price. Pay first at the cashier then take the ticket to the gelato counter. Try the baci. Captivating post, the farinata are particularly motivating. 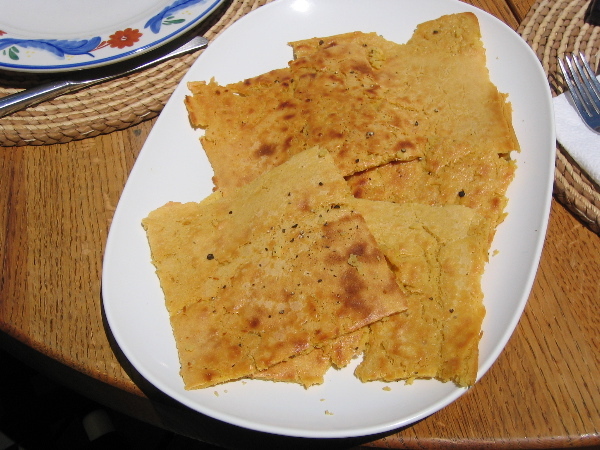 While I've never tried farinata, I have eaten a fair share of Nice's socca and believe that they are very similar. Truly the perfect fast/street food when eaten piping hot! Bridgestone wrote: While I've never tried farinata, I have eaten a fair share of Nice's socca and believe that they are very similar. FWIW, the Riviera/Ligurian socca/farinata are (presumably, still) available at Socca, on Clark. Not an especially great version, but respectable the time I tried it. Socca does a decent job of approximating a a place that might actually be in a tourist beach town between Nice and Genoa (for better or worse). Thanks for the report, Michael. I'm with you on the anchovies in the 5 terre. Focaccia is another essential Ligurian specialty: anchovies on focaccia and a drizzle of oil is just about perfect. Wonderful work, Michael, and it sounds like a delectable vacation, even if that was not the (main) point. To echo your point about the complexity of choosing the right place - the worst meal I had on our last trip to Italy was a bit outside of Venice. After our sojourn in Venice, we had returned to the airport to rent a car to tour the Veneto. By the time we got the car it was past lunch and the troops were restless, so I quickly left the highway and found a little tavern/lunch place with a fairly large dining room in back. Packed, all Italian and it seemed like a place where truckers went for a good, cheap meal. I was beaming, and the difficulty ordering with little Italian, no menu and no English on their part only reinforced my smugness about what a great sleuth I was to have found this gem, quickly and on demand. What arrived was indifferently prepared, mostly from a can as far as I could tell, and only redeemed to any degree by the fact that it was as inexpensive as it was lousy. Ate quickly what I could, paid up and left. Stopped later to pick up some sausage, cheese and bread and had a real lunch then. I am not sure if there was a way I could have seen that coming, given the lack of menus, but I had found a place that was selling purely on price and volume. Got fooled the same way early on a recent trip to Ireland, until I eventually learned to see the signs there. Of course, the problem could be that I am drawn to reallly plebeian spots - I had this fabulous meal about 15 years ago in a lunch place late one day off a side street near La Republique in Paris, before it was anything close to stylish. Everything prepared from scratch and done perfectly. Because they were pretty much done for the day, they kept offering us seconds. The Bride ended up with this massive casserole of Au Gratin potatos (relating to the au gratin one normally eats in no way beyond a similarity of component parts, trust me) next to her and just kept serving herself. On some level, I really want to recreate that experience and it has gotten me into a lot of trouble, food-wise. Anyway, I was knocking back cider by that time, and she was chowing down on spuds and we were really happy. One of those special, shared, moments that make a chow-marriage work. I am sure you had some of those in Italy, too. eatchicago wrote: I guess what I'm trying to say is that in cities full of tourists, if you consider the presence of tourists in a restaurant to be a bad thing, you'll go hungry very quickly. I suspect that I didn't make myself clear enough - I meant as a tiebreaker, when having no other information. To use Chicago as an example, people have mentioned seeing guidebooks on customers' tables when visiting Frontera. Now, of course I would visit Frontera, regardless of how many tourists are in there, because there are still a large number of locals. Likewise, in Firenze, our hotel concierge gave us several recommendations within walking distance. There were tourists at each one, but they were mostly tourists from our hotel. A place with more tourists than locals, however... that sends up big red warning flags of some very poor meals I endured in Europe when one of my less adventurous, more thrifty friends had his turn in picking the restaurant for the night. If the place comes completely recommended by multiple trusted sources (such as the obligatory visit to the Hotel Sacher in Vienna for a slice of sachretorte with a bunch of other tourists), then I'll usually take my chances. Beautiful and captivating post; Thanks for sharing your vacation. The seafood made me cry. What a lovely post! Sounds like a terrific trip. I especially love the photos.